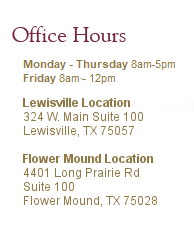 With two locations in both historic old town Lewisville as well as our new location in beautiful Flower Mound, Associates of Ear, Nose & throat Surgery is a full service ENT medical practice for both children and adults which has been serving the Lewisville/Flower Mound area since 1996. Dr. Thomas C. Bramhall established the current practice after completing his training at Eastern Virginia Medical School in Norfolk, VA. Dr. M. Bradley Evans, who trained at Baylor College of Medicine in Houston, TX joined the practice in 2006. We are dedicated to providing our patients with the highest quality medical care and will strive to deliver this care to you and your family in a compassionate and respectful manner. We are focused on treating each patient as an individual using the latest techniques and strategies to improve patients. Licensed clinical audiologists Michelle Millward, MA, F-AAA, Julie Corder, MS, F-AAA and Jamie Lopez, MS, F-AAA are available to provide comprehensive hearing evaluations and hearing aid fitting.